Note: If you're coming here from the Tiles and Tilesets article, read on. If you found this through a search, we urge you to read the main Tiles article first. Tiles can take on more than just square shapes or blank areas. You can define their collision shapes are non-square boxes, slopes (triangles) or even arbitrary polygons. Suppose that we want to set the collision shape for the tile selected below. It's a sloped tile at about a 60 degree grade. To set the collision shape, go over to the Collision Bounds window, scroll using the scroll bars to find the shape you need, and click on it. Tip: You can edit the collision shapes for multiple tiles at a time if you select multiple tiles in the left (tiles) pane. You can do this by clicking and dragging to expand your selection rectangle. Save your Tileset to confirm the changes. Tip: If you've placed a tile inside a scene and change its collision bounds, you'll need to open that scene and save it to make the change get reflected. Sometimes you will need a custom collision shape for a tile that isn't reflected in any of the standard shapes we provide. If this is the case, you can define a Custom Collision Shape by clicking on the + button. You can create either a Box or a Polygon. X and Y dictate the relative position of the box, in case you want it to be shifted off the origin (0,0). All values are in percentages (0 - 100 inclusive). We do this, so that you don't have to worry about how big the tiles are. 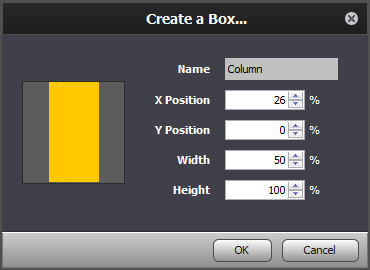 Create a Polygon by defining points and setting their x,y values, either through the table or through drag and drop. 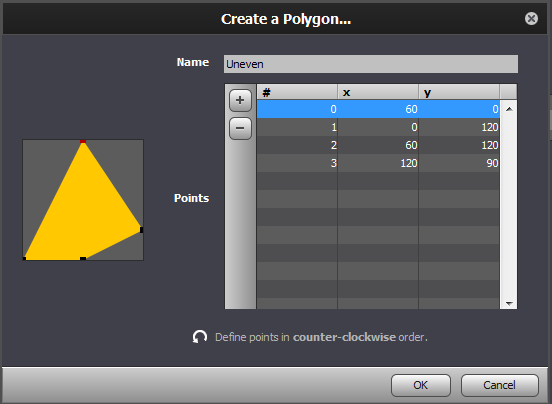 A polygon must have 3 or more points but no more than 12. Note: Define points in counter-clockwise order. If you don't, the engine may crash and warn you about a polygon having negative area. Gotcha: Only convex polygons are supported. Do not enter in a concave polygon such as an "L" shape. Instead, use an actor instead or split the tile into two or more separate tiles that you place on top of each other. Split it into two tiles and super-impose them on top of each other. Easier solution is to do this as an actor instead. Same question as gogisadj - explain how to do this: "If at all possible, break up concave polygon into 2 or more convex polygons instead." So, how do you give a tile multiple collision shapes? I had some of the problems people have above. My tileset that I used had the 'floor' tiles (ie tiles you should be able to walk on) set to collide. I had to turn them off in the tileset to make my character able to collide with everything else. What was happening is that since ALL my tiles had collision boxes, the game was making one giant collision box (that I started inside). Since I was inside it already I wasn't colliding. Now I'm having trouble though. I have a tile that I want to be half a box tall. In other words, the graphic only takes up half the tile, so I should be able to walk in the other half. For some reason, my actor's head still bumps up against the edge of the tile even though I've made a box that's way smaller than that. Correct. I've called that solution at more more explicitly at the end of the article. Re: Tinycyborg's issue (creating L shaped walls) - you could use two boxes instead of a convex polygon. I am working with the example created in the crash courses to evaluate Stencyl. The provided tiles I used have a square collision shape. I added some platforms and lowered the gravity. You can jump to them and they usually act as you'd expect. solid and there does not seem to be a way to escape. What conditions do tiles not work and why? I am thinking maybe they need to be smaller than the actor or something like that. I just happened across Stencyl last night and I've had no problems with using tilesets. You most likely did not tell your Player actor's collision group to collide with Tiles as well as Actors.